July 10, 2018 UPDATE: In order to provide a transition period, 1st Generation Droplet plans will continue to be available via the API using the legacy size slugs. We will provide additional notice before their removal. May 31, 2018 UPDATE: We’ve updated our plans. Get the latest details here. Last week, we shared our 2018 roadmap preview and today, we’re excited to announce the first of many new updates for developers: new Droplet plans. 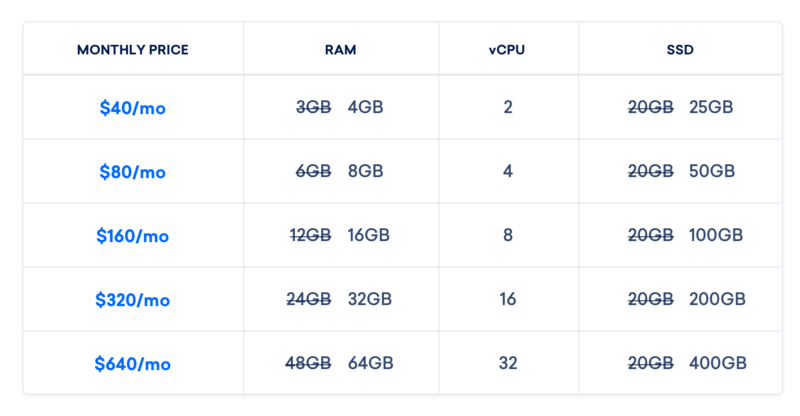 We know that price-to-performance is an important consideration when choosing where to host your application, whether it be a small side project or a large business. That is why we’re upgrading resources across our plans and introducing new plans to give you even more flexibility to choose the right Droplet for your application. 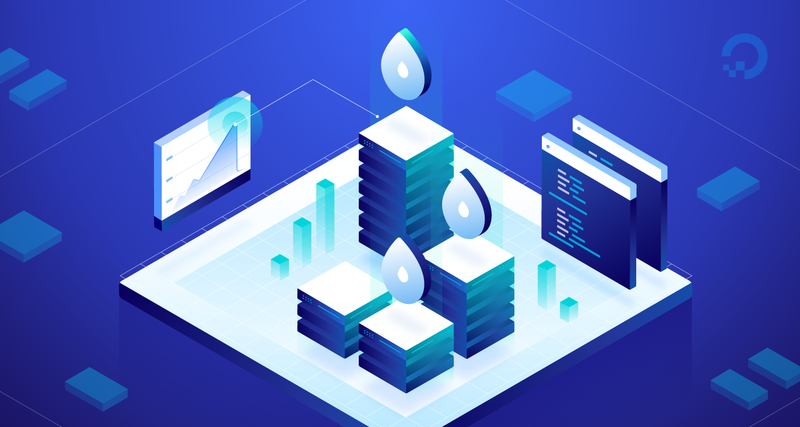 Standard Droplet plans have always offered a healthy balance of CPU, memory, and SSD storage to get blogs, web applications, and databases off the ground. With today’s changes, we have 14 brand new Standard Plans to ensure that these applications can grow and scale as your projects grow. These updated Standard Droplets offer more resources for either the same or a lower price than our previous generation. 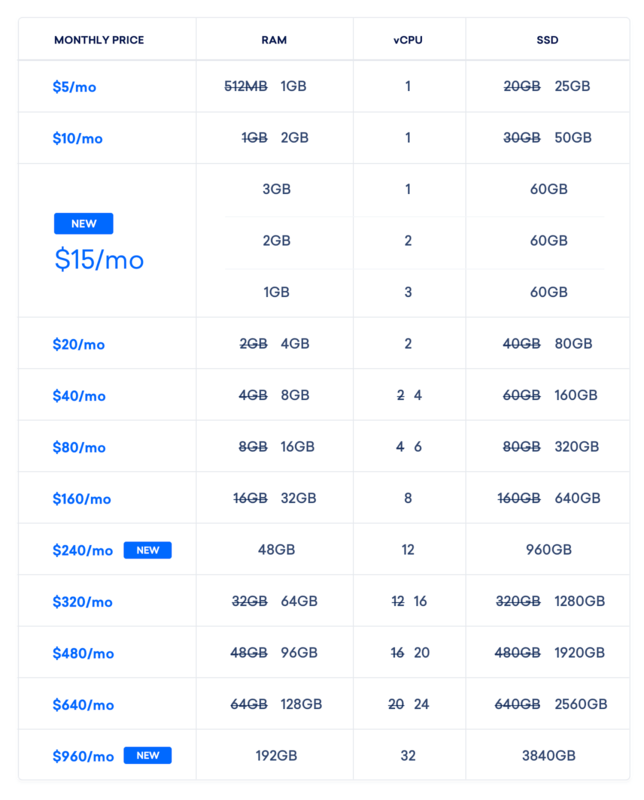 We’ve also introduced three flexible plans, all priced at $15 with varying sets of CPU and memory combinations to give you resource flexibility without worrying about price. We’re working hard at making continuous improvements to our billing system in order to align with changes in customer Droplet usage behavior. We’re happy to share that starting later this year, Droplets will be billed by the second instead of by the hour. This means that you’ll only be charged for exactly the amount of time you use your instance to the second. We understand it is important for customers scaling instances up and down regularly to have the best rate available and we’re happy to get this update shipped for you. Keep an eye out for a future announcement specifically on billing improvements. 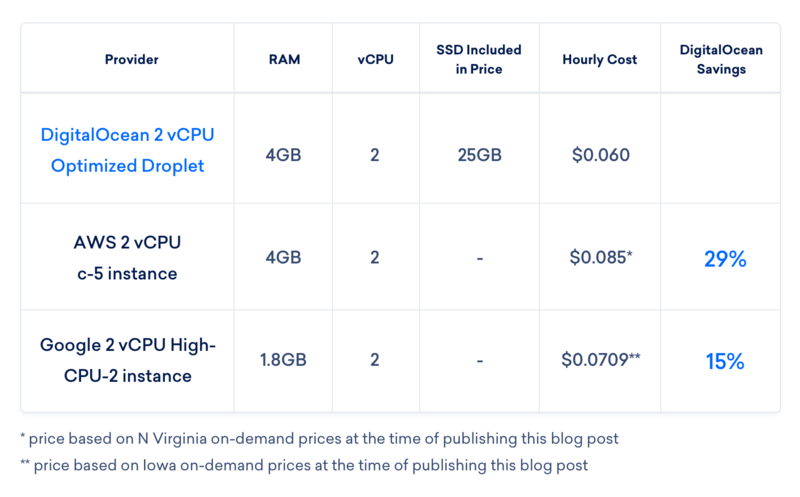 We understand that price-to-performance ratios are of utmost consideration when you’re choosing a hosting provider and we’re committed to being a price-to-performance leader in the market. As we continue to find ways to optimize our infrastructure we plan on passing those benefits on to you, our customers.